Shafer Smith and other scientists at NYU Abu Dhabi’s Center for Prototype Climate Modeling are developing sophisticated computer models to help improve climate prediction and bring more certainty to what the Earth’s weather will look like in the future. Smith, associate professor of mathematics, focuses on variables in our oceans and the significant role that oceans play in global climate change. You study the ocean. But what is it about the ocean that you study? My current work is focused on eddies and vortices in the ocean. These are a lot like storms in the atmosphere. A storm in the atmosphere may be 1000 kilometers across, while a vortex in the ocean may be 100 kilometers across. So they’re about 10 times smaller. 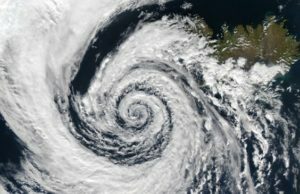 Vortices that can be seen from space are one part of a wide spectrum of turbulent structures that make the ocean a much more dynamic, exotic place than the common conception of the ocean as a dark, still abyss. What do these vortices in the ocean do? Vortices play a key role in communicating between the atmosphere and the ocean and in transporting properties like nutrients and oxygen throughout the ocean. I’ve also started working on something similar to vortices called filaments, which are finer scale. Like vortices, filaments transport heat, salt, and plankton. A recent paper in Science makes an analogy between filaments in the ocean and the alveoli in your lungs, which transport oxygen from inhaled air to your blood. In terms of location, I’m interested in the transport of oxygen in the Arabian Sea. The Arabian Sea is a fascinating environment for this because it’s the site of the ocean’s largest oxygen minimum zone. There is a region between 400 meters depth and 1200 meters depth where the level of oxygen is so low that it can’t support life. Sorry. So there is oxygen in the ocean? How does that happen? Of course. At the surface of the ocean, light penetrates the ocean to about 100 meters. And every spring in the northern and southern hemispheres when the light gets a bit deeper, and turbulence from winter mixing gets lower, the upper layer of the ocean gets shallower and there’s lots of nutrients from mixing over the winter. All of a sudden the light and nutrients bring about a phytoplankton bloom that grows cataclysmically all over. These phytoplankton photosynthesize, converting light and carbon dioxide into oxygen and sugars and releasing them into the ocean. In fact, the oxygen that’s produced by the ocean’s phytoplankton gives us 50 to 80 percent of the oxygen on Earth. All that organic matter in the upper 100 meters grows for a while and zooplankton eat the phytoplankton. But the zooplankton die and fall into the dark ocean and get consumed by bacteria. Bacteria require oxygen for that consumption, so the more stuff that falls down from the upper layers, the more bacterial activity, and more bacterial activity, the less oxygen at depth. The only way oxygen can get back into the lower levels of the ocean is a counterbalancing effect. In the upper layer of the ocean, oxygen in the atmosphere mixes with the ocean. And the parts of the ocean that communicate easily with the deep ocean are able to take that oxygen from the surface layers and replenish the oxygen at depth. In the North Atlantic for example, if you think of the ocean as a series of stacked layers, there’s very dense water at depth, and warm layers at the top, but these layers aren’t flat — they’re curved. Towards the poles these curved surfaces intersect with the surfaces of the ocean, which helps them mix. But the Indian Ocean and Arabian Sea are special because they are blocked by the Asian continent in the north, so these lower levels of water can’t get back up to the surface. Only the upper few hundred meters have their oxygen replenished. The average age of water below 400 meters in the Indian ocean is about 30 years. It’s only fine scale eddies and long distance transport from the southern ocean that can replenish the oxygen taken up by a huge amount of productivity in the Arabian Sea. How is climate change affecting the ocean? And how does the ocean play a role in climate change? About one third of the carbon that’s been put into the atmosphere by fossil fuel burning since the beginning of the industrial age has gone into the ocean. So the ocean has played a huge role in tempering the amount of climate change we would have experienced had it not been there. Through complicated process, you always have to pay the piper, so the carbon that goes into the ocean is related to the level of ocean acidity, and overall ocean acidity is growing. The ocean is like an old man workhorse being abused and taking the punishment to help us out on the surface, but it’s paying a price, because oxygen in the ocean is decreasing faster than we expected and the acidity is rising, meaning that it’s becoming a more hostile environment for sea life. One hundred twenty-five million people on the Indian subcontinent and in Africa rely on fish from the Arabian Sea. And the amount of sea life is related to how much oxygen there is at depth and also to the acidity. What do you hope to accomplish with your work at NYUAD? We’ve got the opportunity to make a big impact. We’ve been offered a great resource and opportunity that bridges the gap between smaller-scale academic work and large-scale climate modeling centers. Most of our work is on the development of highly theoretical algorithms that go into climate models. In between that small scale academic activity and the large scale operational activity of building and running climate models is a whole spectrum of opportunity where we can contribute. For example, one thing we’d like to come up with is a model for how clouds form and to make an algorithm that’s fast and can work in a big climate model. And what we’re doing here is trying to bridge that gap between theoretical developments and operational models. The long term goal is to make these models work a little bit better, and that’s something that would be very difficult to do without the kind of research that’s been offered here. This post originally appeared on NYU Abu Dhabi’s Salaam blog and is available here. This entry was posted in Abu Dhabi, Faculty, Research. Bookmark the permalink.